Served this dip with olive oil crostini at your next party or gathering. Combine basil leaves, walnuts, parmesan cheese, black pepper, salt, and olive oil in a food processor and blend until smooth to make the "pesto" referenced in the fourth step. Soften goat cheese and neufchatel cheese to room temperature. Put goat cheese and neufchatel in a food processor and blend until smooth, no lumps. Add pesto, half-n-half, artichoke hearts and pulse until combined evenly. Season with salt and pepper to taste as necessary. 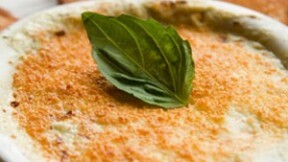 Pour into an oven-proof casserole dish and top with grated parmesan cheese. Bake at 350° F for 10-12 minutes or until top becomes golden brown. Serve with olive oil crostini or your favorite crispy bread or crackers.